The theme park industry continues to be profitable year after year. In particular, waterparks make a splash every quarter and with rising temperatures due to climate change this trend is likely to continue. There are currently around 1,300 water parks in North America according to the World Waterpark Association. Those parks attracted 375 million guests as of 2015, and combined with theme and amusement parks across the country, produced $219 billion in economic impact. In Europe, the amusement park industry annually generates an estimated $5.3 billion and there are similar numbers in Asia, the Middle East and Latin America. waterpark is about 400,000 guests with an average guest stay of 2.7 hours. The typical demographic is families with children ages 2 through 18 so it is not a surprise that waterparks continue to do their best business in the summer months when the temperatures are warmer, and children are on break from school. Current struggles facing waterparks include creating competitive advantages, introducing more thematic elements in the park and expanding the experience to include amenities such as dining areas and entertainment. Years ago the standard model for waterparks was quite simple; provide pools with slides. Today the game has changed. Waterparks are becoming more and more like full amusement parks, with multiple ride experiences, large features such as lazy rivers, and even lodging and retail. With the changing landscape comes the need to be unique and stay ahead of the competition. 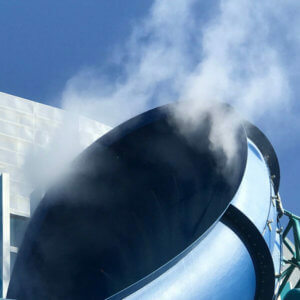 Many waterparks are finding that the best way to do this is to incorporate thematic effects to enhance the experience.